Just try keeping track of the plethora of players in the online patient community / health-focused social network scene. Many patient communities have been started (e.g. MDJunction) by entrepreneurs who were spurred to create their sites by the difficulties friends or relatives had in obtaining emotional and social support during prolonged battles with illness. HopeCube is one such site. HopeCube, like its rivals Trusera and MDJunction, has virtually no presence of medical professionals (unlike the heavy presence of such at sites such as MedHelp). At HopeCube, there are a mere six MDs listed under the category “Health Professionals” and the others on that page were providers of the New Age variety (e.g. 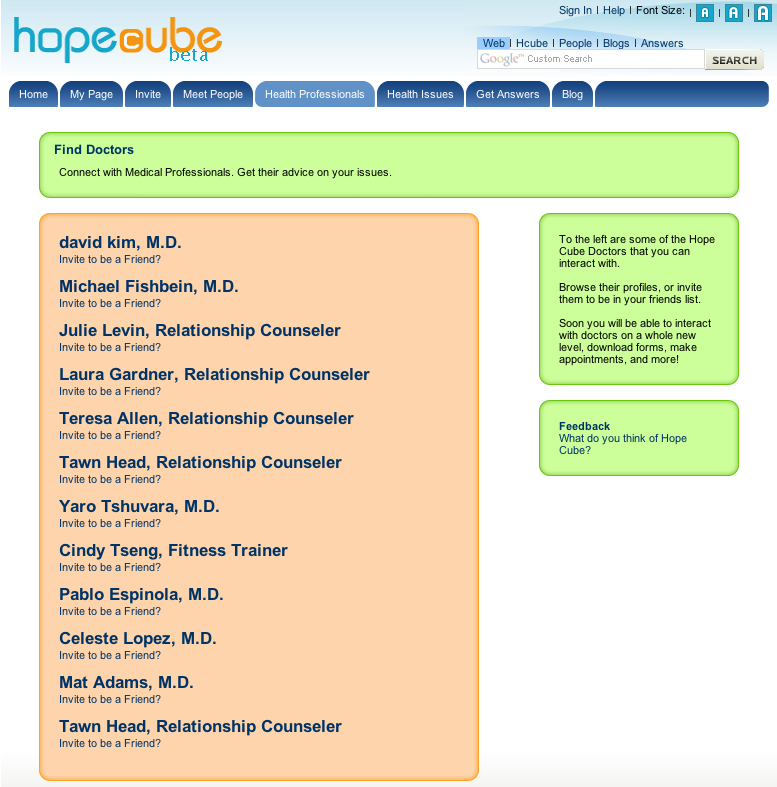 relationship counselors — misspelled on the site as â€œcounselerâ€ — and fitness trainers). The details on this limited number were sketchy and many of the links on the page were dead. One of the doctors listed is Dr. David Kim of Beverly Hills Plastic Surgery, which gives you an inkling of HopeCube’s target audience. 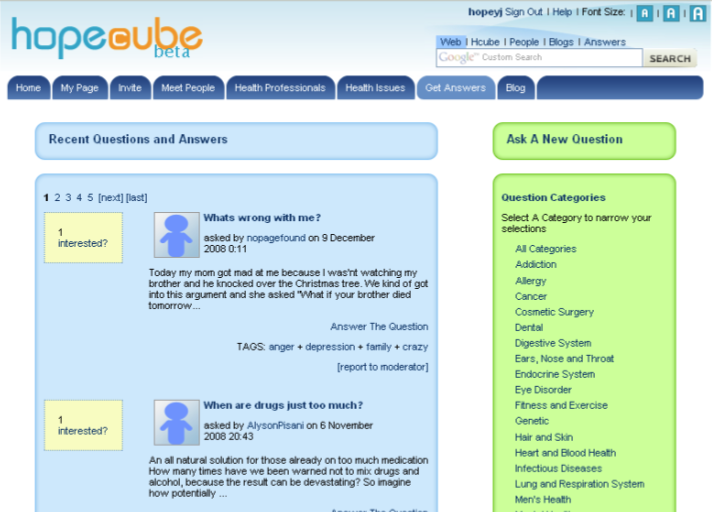 Rather interestingly, unlike the blog of Patients Like Me and that of OrganizedWisdom, which are slick marketing tools, HopeCube’s blog is a forum for HopeCube members who, incidentally, don’t seem to be into tagging their entries given that the vast majority of them fall under the unhelpful rubric “Uncategorized.” HopeCube’s blog appears to be the main method of participation for many of the members. But the participation is asymmetric in that the vast majority of entries have not elicited any comments. HopeCube may not have the lineup of medical heavyweights that is a notable feature of MedHelp, but it does provide helpful links to authoritative sources. For instance, on the amyotrophic lateral sclerosis page the related links were to the Mayo Clinic, MedlinePlus and the ALS Association — all solid, reputable sources. There was also a handy pathway to recent stores on Neurology / Neuroscience News in the online news service, Medical News Today which is a very useful resource in and of itself and one which I have not seen on other consumer health sites or at rival online patient communities in particular. But much of the rest of the site seems mundanely pre-Web 2.0 in many respects. Rather blah interface and much of the site is old-line discussion board question and answer stuff at the member to member level — a far cry from the medical authority-laden dialogues of MedHelp or of the longstanding easy camaraderie among the members of Patient Like Me. You just have to wonder when health consumers will say, “Enough already with one paragraph answers by Joe Average — I will just call my local public library or visit MedlinePlus.” I thought that maybe I was just not seeing a richer interactive experience because I had not registered, so I finally reluctantly did (which, admittedly, went smoothly enough). But I still didn’t see much that wowed me — the interactivity level of HopeCube is circa 2001. I don’t think HopeCube has too bright a future and is pretty pedestrian on the whole. Those who want to get health information from other health consumers would be better off visiting the far livelier, content-rich Omgili Health. Additional patient social networks are listed in the Highlight HEALTH Web Directory. 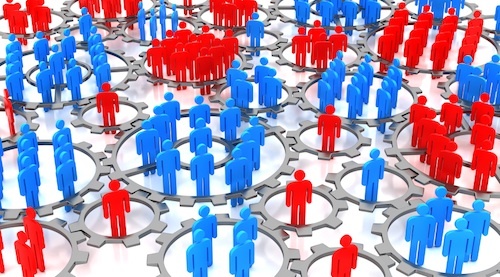 Welcome to the battle for survival among the online patient communities, a.k.a. 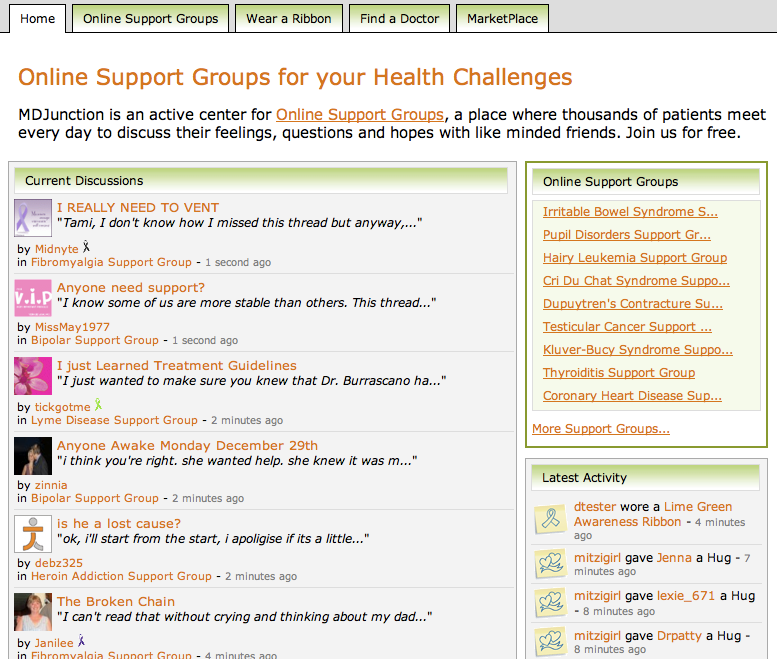 health-focused social networks and patient support groups. Sometimes they are dedicated sites (e.g. Patients Like Me and Trusera), sometimes the patient communities are just one of the features of a greater health-focused site (e.g. RightHealth) and in some cases they form about half of the offerings of a health site (e.g. Healia, MedHelp). Not all are developing the levels of activity that will enable their communities to gain traction. Given the stiff competition, many of the primary health consumer online patient communities are dying on the vine. For example, as of this writing Healia’s Parkinson’s Disease Community consists of only 11 members, a small number for a fairly common disease. It certainly does seem to have quite a bit of recent activity, obviously a key indicator of the health of these sites. For instance, I am checking the site on a Sunday morning and on the home page a member of the Bipolar Type II Support Group posted just one second ago. Oops — I just refreshed the page and now that has been bumped down to 15 minutes ago because of other even more recent entries. That’s certainly a high level of immediacy compared to an industry leader, Patients Like Me. I just checked the Patients Like Me Amyotrophic Lateral Sclerosis Community and the most recent entry was five minutes ago. This illustrates an interesting difference between Patients Like Me and MDJunction: Patients Like Me treats each community as a separate entity (albeit under the Patients Like Me brand name), whereas portals like MDJunction show on the homepage what the most recent activity was in any of the communities (sometimes called forums, depending on the site). Indeed, sometimes forums are within communities, such as Patients Like Me, and sometimes they are distinct entities within the greater site, as with MedHelp. The nomenclature varies with each site, which might be one of the reasons why some sites are less trafficked and some communities devoid of members — it takes time to figure out how each works. Not only can you determine immediately on the homepage of MDJunction what is being discussed in detail, you can note such things as who has just joined the obesity group, who has just registered, who gave another user a hug and so on. That five minutes ago of MDJunction certainly trumps by a long shot in terms of immediacy the “… about 14 hours ago” of Trusera. However, there are definitely some dead spaces in MDJunction. The Amyotrophic Lateral Sclerosis Community, for instance, is utterly inert, save for some initial come-ons a year ago by MDJunction co-founder, Roy Lev. But that is true of almost every ALS community save that of Patients Like Me, given the amazingly strong loyalty the ALS patient community has shown to the first mover for an online patient community for that illness. MDJunction’s Parkinson’s Disease Support Group has 23 members and the most recent posting as of this writing was 12 hours ago. That’s fairly good for such sites in this fiercely competitive space. One always fascinating aspect of the world of online patient communities is the general tone shown toward the medical establishment. For instance, MedHelp touts its ties to medical experts at prestigious institutions (e.g. the Cleveland Clinic). Patients Like Me features pleasant and skillful interjections by a resident nurse as well as commentary and answers by a neuroscientist, but otherwise medical authorities are absent. In contrast, the content of sites like MDJunction and Trusera is almost entirely user-generated, save for Lev’s fairly constant presence in various sections of the site. There are advantages to his omnipresence — it shows his commitment to the service, which is a nice bit of homey personalization compared to the infrequent appearances of Ben Heywood on Patients Like Me. But Lev’s ubiquity on MDJunction verges on hucksterism. It is up to users to determine how much involvement they want from the operators of a site. One rather interesting feature of MDJunction is the option for users to support a cause and increase awareness by wearing a ribbon. A chart delineates what colors of ribbons are designated for various diseases. 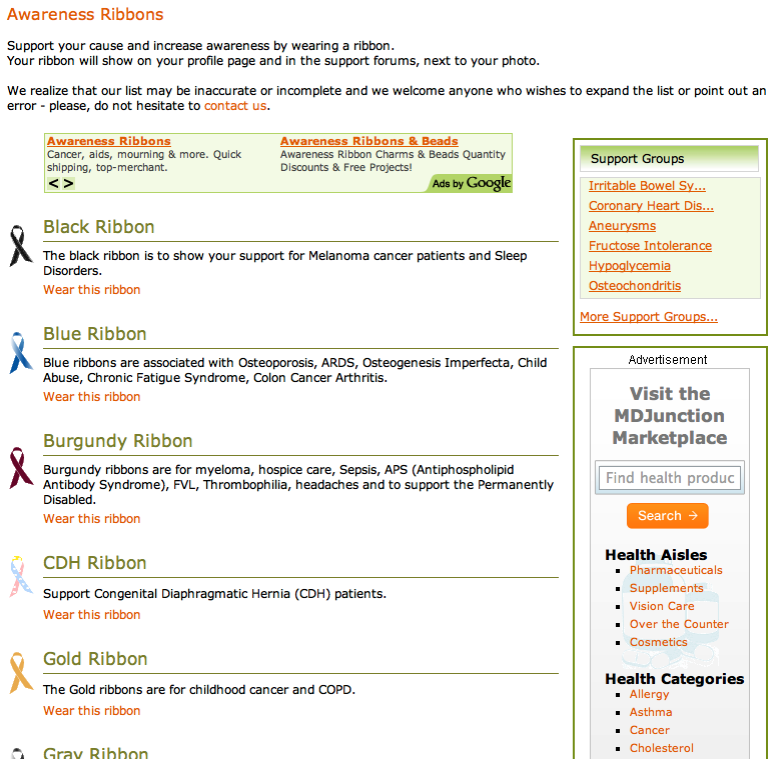 For example, we read, “Burgundy ribbons are for myeloma, hospice care, Sepsis, APS (Antiphospholipid Antibody Syndrome), FVL, Thrombophilia, headaches and to support the Permanently Disabled” and “Blue ribbons are associated with Osteoporosis, ARDS, Osteogenesis Imperfecta, Child Abuse, Chronic Fatigue Syndrome, Colon Cancer Arthritis.” Users can affix icons of such ribbons to their comments on the site. The ads in MDJunction are relatively unobtrusive. Given the punishing advertising climate these days, it will be hard for many of these sites to stay in business. MDJunction seems to have a fairly robust level of loyalty. It will be interesting to see how much of the discussion on medical topics generated on sites like MDJunction appears in search engines results. This is a new phenomenon that bears watching by those concerned about the possible dissemination of health misinformation on the Web. Additional patient social networks and Health 2.0 resources are listed in the Highlight HEALTH Web Directory. About the author: Hope Leman is a research information technologist for a health network in Oregon and is also Web administrator of the grants and scholarship listing service ScanGrants. 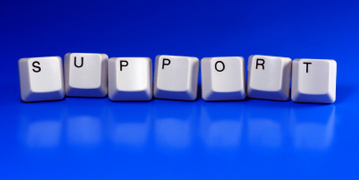 Cancer patients are using online support communities more than ever before. These sites offer both emotional and informational support, and empower patients by enabling them to talk with other patients who are facing similar issues. According to a new study, online support communities for cancers with a high survival rate contain a greater amount of emotional support than do online communities for cancers with a low survival rate . Researchers at the University of Michigan Health System and VA Ann Arbor Healthcare System also found that online support communities for cancers with a low survival rate contained more informational support than did communities for cancers with a high survival rate. The new study, presented last month at the 2008 annual meeting of the North American Primary Care Research Group , evaluated the differences in emotional and informational social support content in online communities for cancers with low and high survival rates. The researchers analyzed over 3,500 messages from 587 individuals in eight online support communities located within Yahoo!Groups and the Association of Cancer Online Resources (ACOR) websites for four different types of cancer with low or high five-year survival rates. Across all communities, there was a greater amount of emotional support than informational support. High survival rate communities contained a greater proportion of emotional support than low survival rate communities (65% vs. 55%). In contrast, low survival rate communities contained a greater proportion of informational support than high survival rate communities (33% vs. 25%). Participants in the study were members of support communities for four different types of cancer: lung cancer, melanoma, pancreatic cancer and thyroid cancer. They participated in eight different online communities and were all reviewed under the same time period. When primary care providers refer individuals to online communities for support, they should be aware that there might be differing amounts of support based on the survival rate of a particular cancer. According to the National Cancer Institute’s Surveillance Epidemiology and End Results (SEER) Cancer Statistics Review, which reports the most recent cancer incidence, mortality, survival, prevalence and lifetime risk statistics, from 1975 to 2005 cancer patients with thyroid cancer and melanoma of the skin had high survival rates (96.6% and 91.2% respectively) while lung cancer and pancreatic cancer had low survival rates (12.1% and 5.1% respectively) . In addition to helping patients, online support communities help family and friends cope with the struggles that cancer presents. This is the first study to assess the influence of cancer patient survival rates on social support content in online communities for cancer. A number of patient social networks are listed in the Highlight HEALTH Web Directory. Buis et al. Relationship between cancer survival rate and social support within online communities for cancer. 2008 Annual Meeting of the North American Primary Care Research Group, Rio Grande, Puerto Rico. 2008 Annual Meeting of the North American Primary Care Research Group (NAPCRG) Program. 2008 Nov 15 — 18. Cancer survival rates impact type of Web communities used by patients. University of Michigan Health System press release. 2008 Nov 18. SEER Cancer Statistics Review, 1975-2005, Age-adjusted SEER Incidence and U.S. Death Rates and 5-year Relative Survival Rates, National Cancer Institute. Bethesda, MD, based on November 2007 SEER data submission, posted to the SEER web site, 2008.